An essay written by Rina Deshpande , an RYT-500-certified yoga teacher, researcher, and writer based in New York City. 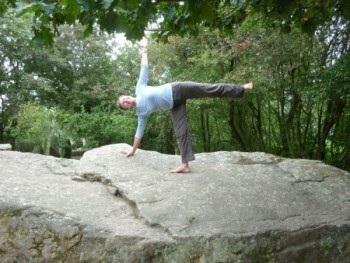 She began her yoga practice in 2004 and earned her Master’s degree from Harvard’s Mind, Brain, and Education program. Check out her website, Rinadeshpande.com. Q: Tell me a little about the history of your business? A: I have been teaching Iyengar Yoga in Bend since 1998. My dream from the start was to have my own studio but since I was the only Certified Iyengar Teacher in Central Oregon, I had to slowly build my reputation and student base while teaching out of my home studio. In October of 2010, I was presented with the opportunity to open our beautiful, spacious and fully equipped studio. I now offer seriously committed students the opportunity to apprentice with me. In our system, certification is granted after approximately 5 years of supervised study and only then by passing two comprehensive examinations Iyengar Yoga Certification is recognized around the world as the Gold Standard of yoga teacher training and assures one of a committed, knowledgeable and professional teacher. Q: What are the fundamentals of Iyengar yoga? A: Iyengar Yoga is the culmination of a lifetime of work by world-recognized, yoga master, B.K.S. Iyengar. As a child, Iyengar was poor, sickly and weak. By the age of 16 he had already suffered from Typhoid, Malaria and Tuberculosis. Through yoga his health was restored and he felt inspired to share yoga with all humanity. In 2004, Time Magazine awarded him “one of the 100 most influential people in the world”, so it seems he met his goal! The Iyengar method is based on a precise approach consisting of 1. aligning all parts of the body in each pose, 2. intelligent sequencing of poses to gradually but dramatically transform the body and develop inner awareness 3. use of yoga props. This approach provides maximum benefit with minimum risk of injury. It is profound, transformative and accessible to everyone. Q: How does Iyengar differ from other forms of yoga? A: 1. Iyengar teachers demonstrate each pose and give clear and detailed instruction on how to proceed. It is a real learning environment and students progress from one level to the next. 2. We start adult beginners with standing and seated poses that target shoulder and hip opening rather than flowing or Vinyasa classes. This helps to avoid the common wrist, shoulder and lower back injuries caused by repetitive, weight-bearing movements before proper alignment is understood. Mindful alignment is taught from the very first class and Iyengar students gain a solid foundation in how to do each pose correctly for maximum benefit. 3. Iyengar is not hot yoga. Aside from the obvious environmental concerns, it’s simply not necessary. Yogis have always practiced in Himalayan caves without any heat! Gymnasts and dancers work out at normal temps. Most importantly though, Iyengar class sequencing adequately prepares the body for increasingly challenging work. We also encourage our students to grow an independent home practice so that yoga becomes a lifestyle and not just a class they attend. 4. Mr. Iyengar is credited for introducing props (such as blocks, belts, chairs, etc.) to yoga. Thus, his teachers are the most highly trained in how to use props correctly. Props are one reason why Iyengar yoga can be done by anyone at any age or degree of fitness. Both athletes and older students find them particularly helpful to overcome stiffness or heal from injuries. Iyengar Yoga is both rigorous but doable at any age under a Certified Iyengar Teacher’s careful and learned guidance. A: Most people have already heard how yoga can improve ones flexibility, strength and balance, etc. Athletes can improve performance and possibly avoid injuries by starting yoga sooner than later! Yoga instills focus and mindfulness which can support and improve every activity you enjoy. Overcoming limitations in your body gives you a more positive outlook on life! Q: How has yoga improved your life? A: It has given me the strength to stand on my own two feet and live a life of integrity despite life’s challenges. As a cancer survivor I experienced the healing power of restorative poses which enabled me to teach my full schedule even while going through chemotherapy. It is the basis of my mental, physical and spiritual strength and balance. Q: What would you like people to know about your studio? A: Try one class to see for yourself how this method of classical Hatha yoga can be of benefit to you. We offer Free Introductory classes on a monthly basis or you can just drop in to any beginner level class. Everyone is welcome!